Our non-invasive 3D-HIFU targeted fat removal treatment – high intensity focused ultrasound – is the most advanced (and one of the most sought after) treatments available on the market. The procedure is set to replace cryolipolysis as the new approach in targeting and destroying fat cells, with treatment time significantly reduced compared to the previous method. Unlike cryolipolysis (cryo freeze), 3D-HIFU destroys all fat cells without leaving any behind. 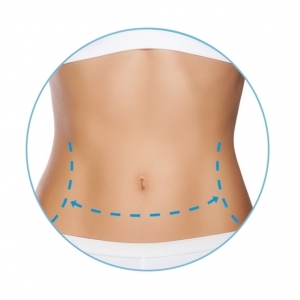 3D-HIFU destroys fat cells by delivering high intensity, focused ultrasonic waves. The ultrasonic energy increases as the waves travel through the subcutaneous layers and deep into the tissue, against the resistance of the skin. This exposes the fat cells to high temperatures, resulting in rapid and total fat cell destruction. At the skin’s surface the intensity of the waves is too low to cause tissue damage, making 3D-HIFU a completely safe procedure that requires little to no downtime for recovery. It can be used to target fat on areas of concern such as the abdomen, flank, thighs and upper arms and achieves skin tightening in the area due to the thermal effect, which creates collagen contraction.